I've got mixed feelings about actress Cynthia Nixon and her foray into politics. On the one hand, I'm really excited to see a true progressive looking at the governorship of my state. I have to say, though, that I was not happy with some of her remarks about unions. I don't know what deals the unions have now, so I can't comment on that. I was sorely disappointed, though, to hear a nominal progressive criticize union. 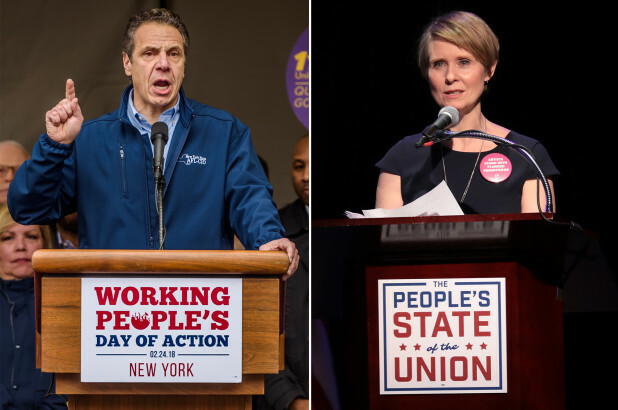 It reminded me of no one more than Andrew Cuomo himself, whose first campaign platform entailed going after unions. This opened my eyes a lot, and made Cuomo the first Democrat for whom I declined to vote. I voted for Green Howie Hawkins for Governor these last two rounds. Nixon, though, is very good on education. Unlike Cuomo, who takes suitcases full of cash from charter folk, she won't be doing that. She has an entirely different POV. Now here's the thing about Andrew Cuomo--he's making an effort to look good to us, and has been doing so over the last year or so. Cuomo observed the 2016 election, and read the tea leaves. They told him that America wants a government that fulfills its needs. Some of those needs are universal healthcare, affordable college, and a living wage. I repeat that often. Another, of course, is a decent K-12 education for all of our children. Cuomo has indeed made concessions. He's moderated his tone over firing all of us because of highly flawed test scores. He's created a program that will make it easier for some New Yorkers to go to college. He's stepped back on the IDC, which kept the Senate in GOP hands even though Democrats held the ostensible majority. Even though that thwarted a whole lot of improvements for New Yorkers, Cuomo can now say he's stopped it so as to disassociate himself from them. The problem with Andrew Cuomo, of course, is that he has no moral center. He sways whichever way the political wind blows. He is for sale to the highest bidder, so long as whatever the bidder is buying will aid him toward reaching his Prime Directive--the advancement of Andrew Cuomo. Let's focus a little on reckless behavior. Our parent union, the AFT, endorsed Hillary Clinton well before we saw any teacher voice at the polls. There was a kabuki dance of deciding the endorsement, but we ultimately got behind a candidate who did not support universal health care, a living wage, or affordable college. We got behind a candidate who mustered the audacity to lecture AFT about what we could learn from "public charter schools," whatever the hell they may be. And just in case you hadn't noticed, Hillary Clinton lost that election. So by Mulgrew's logic, even though it was not our intent, we are responsible for Donald Trump. That's quite an albatross to hang around our own necks. You'd think we'd learn something from that, but you'd be wrong. Rather than embrace a progressive candidate who holds causes dear to our hearts, we condemn her for one thoughtless comment. We might try to talk with her, negotiate with her, but instead we dismiss her out of hand, back a man with no integrity whatsoever, and hope the progressive wind that's blowing him this week will not change direction any time soon. We ignore mountains of evidence that Cuomo will do whatever is expedient for Cuomo, and brush away Nixon just as we brushed away Bernie Sanders. This is an egregious error. I'm sure that UFT leadership will disagree, since they know better than me, they know better than you, and making a potentially fatal error in the 2016 Presidential campaign has done nothing to persuade them they are fallible in any way, ever. But it's not a huge leap of logic to say that Cynthia Nixon's philosophy more closely resembles that of working teachers, just as Bernie Sanders' did. The blanket condemnation of Nixon is precisely the same as that of Sanders. The blind support of sure thing corporate Democrat Cuomo is precisely the same as that of sure thing corporate Democrat Clinton. Now I'm reading that union leadership may set up their own ballot line to make sure Cuomo wins and the progressive gets no traction whatsoever. What has leadership learned from the debacle that was the 2016 election?